Anyone that uses garlic will absolutely love this Garlic Grater Gourmet Tool. 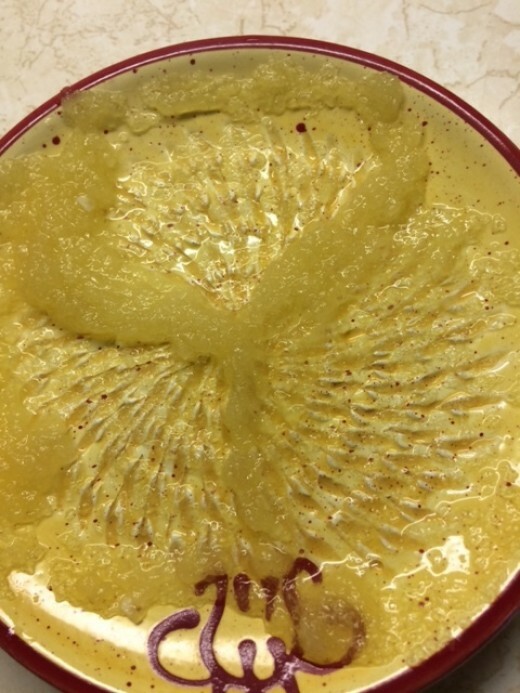 It not only peels your garlic with such little effort but it also grates and purees the garlic into a smooth paste. Spread the grated garlic right onto bread to make delicious garlic bread. This three-piece tool is easy to clean and is dishwasher safe. 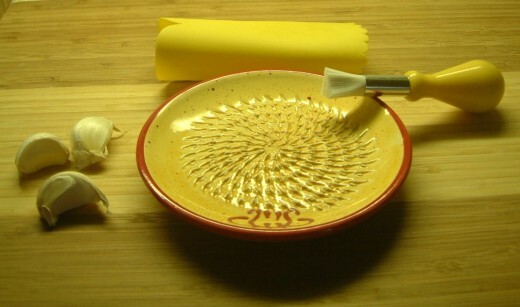 Set consists of one ceramic 5 1/4" round plate, silicone garlic peeler and a kitchen brush. Grate ginger the same way in which you used this tool for the garlic. Have this tool sitting right on your table to grate Parmesan cheese onto a salad or your favorite pasta dish. Next time you need lemon or orange zest get out your Grate Gourmet tool. Chocolate nuts and hard spices are very easily grated. Drizzle a freshly grated strawberry over some ice cream. Add fresh grated nutmeg right into eggnog. If you are making soups and stews or any sauces, marinades or dips that require garlic or ginger and you want that wonderful flavor to stand out in the dish try grate your ginger or garlic and brush right into the pot. Just think how wonderful your next steak will taste using grated fresh garlic. Add grated garlic right into mashed potatoes. Make fresh salad dressing and add fresh garlic, ginger. Put the garlic clove in the silicone cylinder and press down on the peeler while rolling along your counter. The peel will quite easily be removed. Holding the root end of the garlic grate along the plate. Once grated take the brush and brush off the plate. Use the same method for grating ginger, chocolate, lemon peel, strawberries, nuts, hard cheeses and more. Here I've grated one large garlic clove to be used in a recipe I'm making. WOW I really like your description and the looks of this garlic grater. Since it's ceramic it should be easy to clean up too. I'm thinking I'll have to buy one after the first of the month. Nancy, I absolutely love mine and would be so lost withoout it. Oh, this is one kitchen gadget I would love to have! I can definitely see using the grater for more than just garlic. Thanks for all the other ideas. Ruth, You'd probably love it as much as I do.